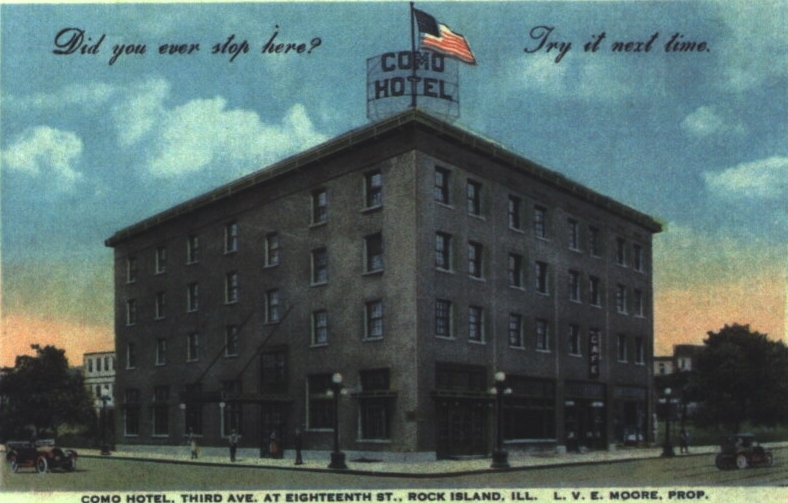 Like many downtown Rock Island buildings, there’s a long history for the Como Hotel, once at the southwest corner of 18th Street and Third Avenue. An 1886 Sanborn Fire Insurance map and an 1889 birdseye view map show that there were three businesses – a wholesale liquor business, a harness shop and a horse collar factory — in what looked like a single large three-story building facing Third Avenue. The liquor business later expanded and Parker Laundry moved into the horse collar place. These were considered separate buildings under separate ownership, but were designed to look like a single impressive building, much as the Star Block at the northwest corner of 19th Street and Second Avenue does today. The entire structure was acquired by L.S. McCabe, owner of the department store across the street, who used it as the store’s warehouse. In 1912, Mr. McCabe organized the Colonial Hotel Company to convert it into a first rate hotel as part of his continuing vision to expand business on Third Avenue. The success of his Safety Building (the subject of another postcard article) built a few years earlier had confirmed that his plan was well founded. The original building was unrecognizable in the new hotel. A fourth story was added and the interior was gutted and rebuilt. On the exterior, many new windows were added and the original brick was covered in rough stucco, a very popular finish of the era. Windows on the ground floor were said to contain small leaded panes. The intent – as reflected in the new name – was to make the hotel resemble “an old-fashioned colonial mansion.” The total cost, not including furnishings, was reported as anywhere from $65,000 to $130,000. 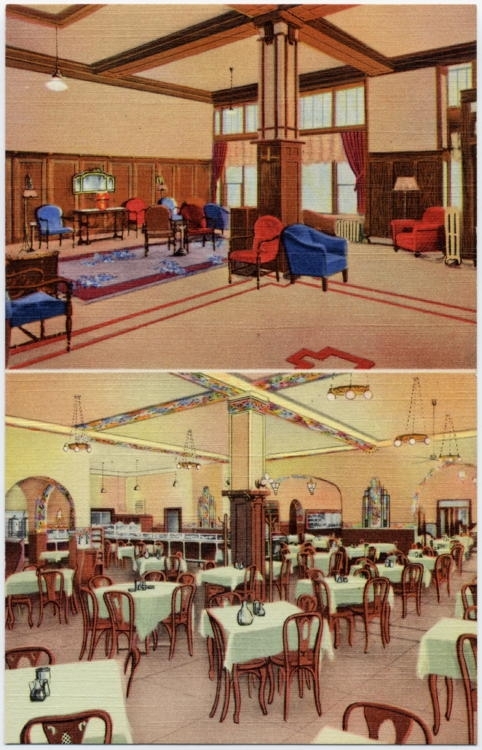 A drawing in the Argus at the time the Colonial Hotel opened shows it looking much like this postcard. The only differences are brackets under the hipped roof and tiny balconies extending beneath some of the windows. It is possible that these features were never actually built but were part of architect Olof Z. Cervin’s original design. The Colonial name was spelled out vertically on a tall corner sign. The hotel lobby was at the northeast corner of the building. It had oak paneling with bronzed plaster above. A Montgomery elevator that extended from the basement to the top floor .was located near the desk at the southwest corner of the lobby. 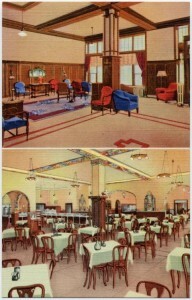 A mid 1930s postcard from the Curt Teich archives shows the lobby and café. South of the lobby was the café, finished in a green-toned oak paneling. A small private dining room with two overlooking balconies adjoined the café. These balconies, which were screened from view by wooden grilles, were for the nightly orchestra and the steward. West of the lobby was a bar room, entirely finished in mahogany. At the rear of the bar was a “private stag grill room.” A barbershop was west of the bar at the front of the building; behind it was a billiards parlor. There were 110 rooms on the second through fourth floors, with each room having hot and cold running water and a telephone. The larger rooms and the suites had private baths as well. Baths were also located off corridors. Rooms around the outer walls were furnished with solid mahogany and “massive” brass beds, while the interior rooms were furnished with oak and brass. An innovative ventilation system was said to make these inner rooms cooler in summer than the outer ones. All of the rooms had Axminster rugs, but the specially furnished bridal chamber was provided with a velvet rug. Every floor had access to a mail chute and clothes and dust chutes. Floors in public areas, bathrooms, and kitchen were made of a hand trowelled “composition” – probably cement-based — in soft colors. They were reported to be easy to walk on and easy to keep clean because the corners were rounded. The hotel officially opened on September 25, 1913. Hundreds of people attended the event. Flowers filled the lobby and the Munger Ladies Orchestra (all four pieces of it) played from the balcony that overlooked the café where 200 partook of the evening’s special dinner. The hotel remained part of the McCabe estate for its entire life, but it was leased to several different managers over the years. In 1921, L. V. Moore took over operation of the hotel and changed its name to the Como. The featured postcard was likely made for Mr. Moore about that time, to help publicize his new hostelry. He removed the vertical Colonial sign from the corner and put a new Como roof sign in place. In 1933, the hotel was taken over by Earl Aubrey who operated it until 1961, when the McCabe estate sold it to Rock Island Bank & Trust across the street. When the bank announced their intentions for the property, the Argus story reported that a “downtown Rock Island landmark” would be demolished. There was still a year’s grace left. Demolition of the Como and the adjacent Goodrich store for a parking lot took place during the first week of October, 1962. The hotel, part of L. S. McCabe’s vision for Third Avenue, was just shy of its fiftieth birthday. This article, by Diane Oestreich, is slightly modified from the original, which appeared in the Rock Island Argus and Moline Dispatch on November 3, 2002.